Mar-Train Heavy Haulage first became involved in motorcycle racing in 2004 as a personal sponsor. After a few years they gradually grew a deeper interest in the sport and became title sponsor for Denver Robb, who competed in the BSB Supersport Cup in 2006. 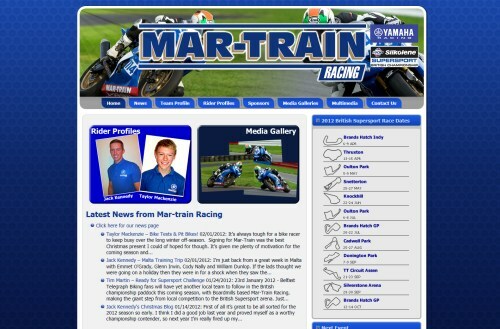 That enthusiasm and support then encouraged them to go it alone, and in 2007 Mar-Train Racing was formed. We’ve helped build a dynamic and informative website for the team, using a content management system that they can update with the latest team news, photographs and videos. The site also incorporates social media feeds including twitter feeds from the riders to keep their fans up to date all the time.